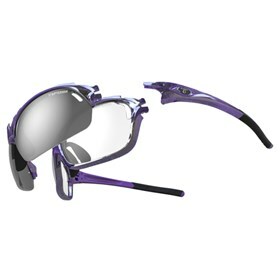 The Tifosi 1301203701 sunglasses comes with 3 lenses and gloss crystal purple finish frame. The sunglasses are made of Grilamid TR 90 a homopolyamide nylon that features an extremely high alternative bending strength, low density and high resistance to chemical and UV damage. This features a unique frame interchange system that integrates full frame, half frame and/or shield eyewear into one complete kit. It offers hydrophilic rubber ear and nose pieces for a no-slip fit. The Tifosi 1301203701 has many exciting features for users of all types. The Tifosi 1301203701 is sold as a Brand New Unopened Item.